It is interesting when you start reading out of your field how many interesting ideas one discovers that are applicable to education. Ken Blanchard is one of the world leading experts on management and leadership. He is the author of a series of books called the “One Minute Manager”. He, and his team, have sold millions of books and empowered managers and leaders in a range of industries worldwide in simple and effective approaches to developing leadership and managing their organisations. In “Leadership and the One Minute Manager” I discovered an interesting table (see Figure 1 below) where the One Minute Manager discusses “Situational Leadership”. The principal behind the approach reminded me greatly of how inquiry–learning, project-based learning can be designed to empower and develop skills in young people. It actually reflects the essence of what Bertram Bruce from the University of Illinois pointed out about the stages that teachers must go through to develop skills in leading inquiry learning (Figure 2). 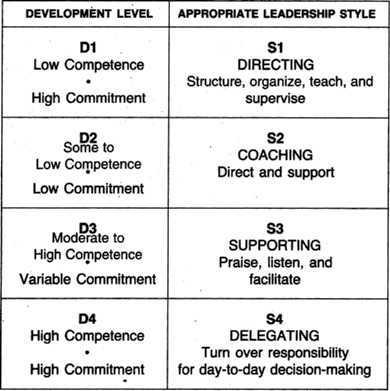 The table outlines the relationship between four developmental levels and the four leadership styles that a manager / leader would use with the person in that developmental level. 1. Directing – for people who lack competence but are enthusiastic and committed. They need direction and frequent feedback to get them started. 2. Coaching – for people who have some competence but lack commitment. They need direction and feedback because they are relatively inexperienced. They also need support and praise to build their self-esteem, and involvement in decision making to restore their commitment. 3. Supporting – for people who have competence but lack confidence or motivation. They don’t need much direction because of their skills, but support is necessary to bolster their confidence and motivation. 4. Delegating – for people who have both competence and commitment. They are able and willing to work on a project by themselves with little supervision or support.